1 very small sprig of fresh oregano (optional, but a nice addition). Optional: 1 slice of Bacon or ham, this is completely unnecessary, but I throw it in if I have any left I need to use up. Dice the garlic very finely/mince it with the knife. Finely dice the onions. 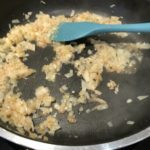 In a deep, heavy-based frypan gently fry the onions and garlic with a little olive oil over medium heat until they are clear and beginning to brown on their edges. 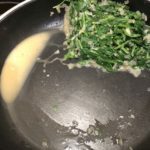 Deglaze the pan with the juice from half a lemon and a few tablespoons of verjuice or white wine. 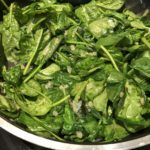 Drop about half the spinach on top of the onions and wilt over low heat, turning the spinach occasionally to ensure it wilts evenly. 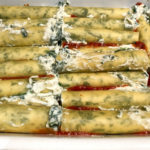 Once the spinach has reduced in size by half add the remaining spinach and cook turning occasionally until the spinach has wilted. 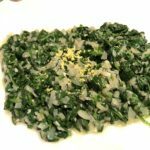 Remove from the heat and gather the spinach and onion to one side of the pan, apply gentle pressure to squeeze out some of the extra liquid. 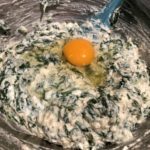 Tip off the excess then gently remove a little more liquid from the mix by patting the ball of spinach and onion with a couple of pieces of paper towel. 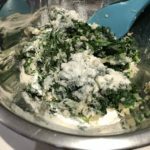 Tip onto a large cutting board, add a tiny amount of lemon zest, then roughly chop the spinach to break up the stems and prevent any long stringy pieces. Scrape into a bowl, fold in the semolina, pepper, and nutmeg. 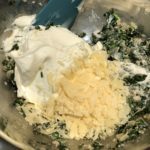 Fold in the parmesan and ricotta then taste the mixture, add salt and pepper to balance the filling. 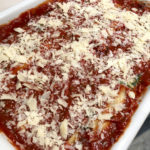 Fold in an egg then place in the fridge until it’s time to fill the cannelloni. 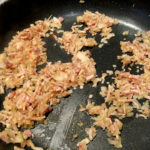 Very finely dice/mince the garlic and chili, finely dice the shallot and the onions and bacon or ham, I only add meat to the sauce if I have it in the fridge and need to use it up. 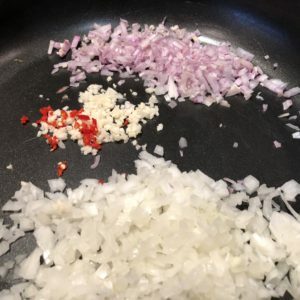 Fry the onions, shallot, garlic, and chili in a little olive oil stirring regularly to ensure even cooking. 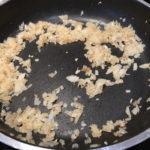 Cook until the onions are evenly browned then deglaze the pan with some verjuice, white wine, or stock and cook out the excess liquid. 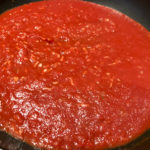 Pour in the Passata, add a few grinds of pepper and simmer for 5-10 minutes. 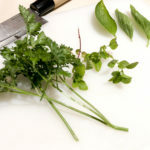 While the sauce simmers, finely chop the basil, parsley, and oregano and put to one side. 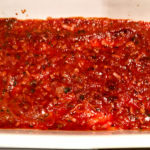 Once the sauce has thickened slightly and the raw taste has gone from the tomatoes remove from the heat and stir in the herbs. Taste the sauce and add extra salt and pepper to balance off the seasoning. 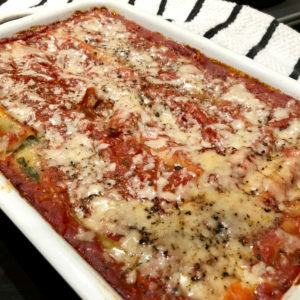 Pour a thin layer of sauce into the bottom of a medium-sized baking tray. 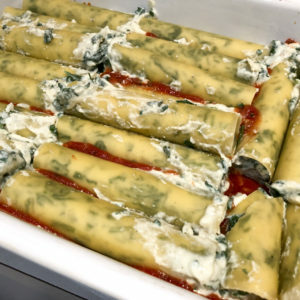 Fill the cannelloni tubes, I’ve tried using a piping bag to load the filling, but I found it easier to load the tubes by picking up blobs of filling with my fingertips and use my thumb to force the mixture into the tube. Pack the tubes tightly ensuring they are filled al the way to the ends. Lay them in a neat layer on the bottom of the tray then cover with the remaining sauce. Sprinkle the top with parmesan. 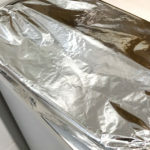 Cover with foil and bake at 180C for 20 minutes. Uncover and bake for an additional 8 minutes to semi crisp off the top. New recipes being added all the time. 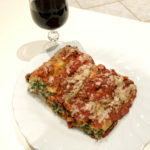 Check out the recipes page to see the full list so far. 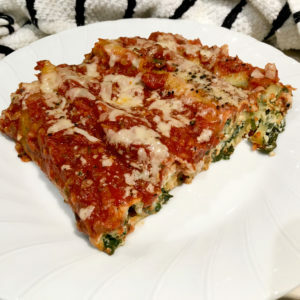 © 2019 Robert's Cakes and Cooking.